Click here here for Full Year Calendar and additional calendar resources. Join Us for a PTA Meeting in Queens! Dr. Tracy A. Dennis-Tiwary will discuss how to talk to kids about anxiety and help tweens and teens cope with their anxiety. She will address the role of digital technology and social media in teen anxiety. A bus will depart from HCHS at 5:30pm. Please email bus@hunterpta.org to reserve a spot. The HCHS PTA Auction will take place in less than 1.5 month while the deadline for the auction item donation is less than a month. Leading to the big night, the Auction Team would like to ask your help in the evening of March 6th, 2019, Wednesday, to contact potential sponsors for goods & services, as auction items. This in-school volunteering event will be a great way for you to support your child and support his/her school. Please let us know if you have any questions. We look forward to your support. Join the entire HCCS community on Monday, February 11th to learn about potential improvements to our beloved "Brick Prison". 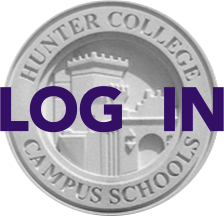 The presentation will be given by Hunter College President Jennifer Raab, at 6:30 PM in the Auditorium. We hope you have had an enjoyable and productive summer break. The new school year is just around the corner, and we look forward to seeing all of you in the next few weeks. We welcome the Class of 2024 and their families and are delighted that you'll be joining our HCHS community. As a short note of introduction to our new families, we will be serving as PTA Co-Presidents. Paul Radvany is the parent of both a rising 12th grader and a recent alum, as well as an HCHS alumnus himself. He is a professor at Fordham University and serves as a mediator. He has served as a grade representative, an assistant legal counsel, and -- most recently -- as a PTA Co-President. Carin Barbanel is the parent of a rising 12th grader. Carin has served as both a Recording and Corresponding Secrectary. Carin works in industrial insulation. Following are some updates and reminders about important school events and PTA activities, as well as a checklist to help your family get ready for September, but please consult the school’s website and mailings as dates can change. Join the terrific team that oversees communications from the PTA. Help us create emails to the parent body. We have a full-service email system in place, which we'll show you how to use. Just bring a willingness to get involved. Contact president@hunterpta.org for more information. The Fundraising team of HCHS PTA has provided a handy checklist of things you can do to help financially support our school. Please make sure you have checked off each of these items on your To Do list. Without your help we are not able to fulfill our mission of providing funds to cover essentials such as professional development for teachers, as well as extra curricular activities from sports to clubs to newspapers to contest participation to music and much more. Update Your Online Contact Information Now! The Online Parent Directory is a great source of contact information and search tool for parents. By editing your directory listing, you have full control over what information other parents see regarding your family. Read the how-to's below. Our PTA and school websites offer a wealth of information and we would like you to use them as a resource to find out answers to your questions. 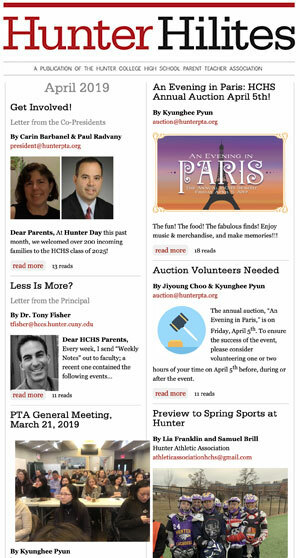 For example, do you wish you could just click on a link to see the safety patrol schedule? Or do you want to see the notes from the last counseling coffee that was attended by more than 100 parents? This and other information is all here. Here is a sampling of what you can find. Please remember to log in to see the full list. Click on the links to see more! Need step-by-step directions? 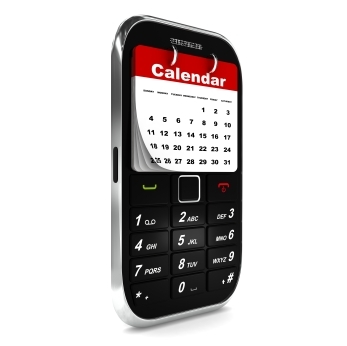 Click to read instructions on how to subscribe from various calendar applications and devices.